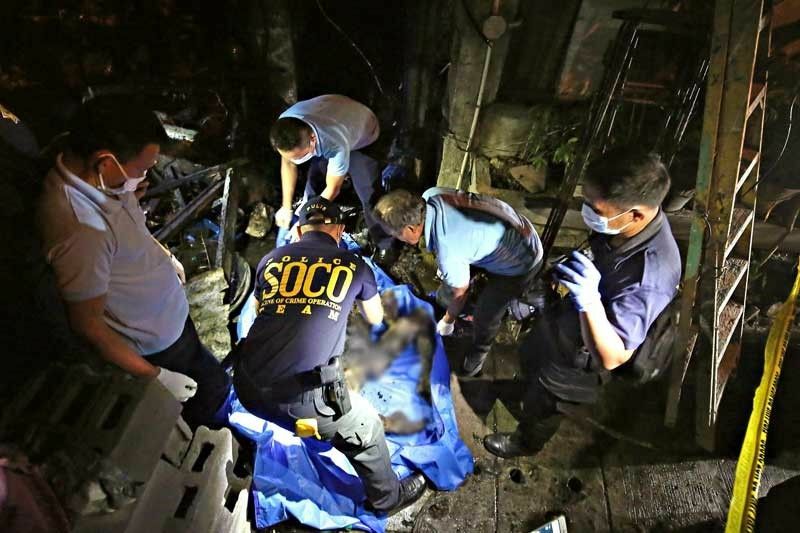 MANILA, Philippines — Nine persons, all relatives, died in a fire that engulfed their two-story house in Maricaban, Pasay City early yesterday. Julius Wablas, 39; his wife Rhea, 40; and their children Julie, 16; Nichole, 9; and Jurick Andrea, 3; Michael Calma, 44, and his sons John Clark, 17; Mark Joseph, 23; and Andrew James, 11, were trapped in the house owned by Wablas along Almazor street in Barangay 185, the Southern Police District said. The blaze started at around 2 a.m. and reached first alarm before firefighters put out the flames at around 3:14 a.m.
Three of the victims were found in the bathroom, two each on the second floor and near the gate as well as one each in the kitchen and in a room. Calma and his wife, Jasmin, had gotten out by climbing out of a ground-floor window but Calma went back to try and save their children. Speaking to reporters, Jasmin recalled that she woke up to smoke filling the house, and noticed that it was coming from a computer set on the ground floor. The fire razed the entire house, with damage pegged at P50,000.